Check out our range of interesting human body facts for kids and learn some fun trivia about how the human body works. Check out these fun lung facts for kids. Learn more about the amazing organs that allow us to breathe in the oxygen we need to live as well as breathe out the waste product carbon dioxide. Read on and enjoy all the interesting facts about lungs. The primary functions of your lungs are to transport oxygen from the air you breathe into your bloodstream while taking away carbon dioxide, which is released into the air when you breathe out. Most vertebrate animals (animals with spines) have two lungs. Your left and right lungs aren’t exactly the same. The lung on the left side of your body is divided into two lobes while the lung on your right side is divided into three. The left lung is also slightly smaller, allowing room for your heart. Can you live without one lung? Yes you can, it limits your physical ability but doesn’t stop you from living a relatively normal life. Many people around the world live with just one lung. People who have a large lung capacity can send oxygen around their body faster. You can increase you lung capacity with regular exercise. When resting, the average adult breathes around 12 to 20 times a minute. The study of lung diseases is known as pulmonology. As well as other parts of your body and your general health, smoking is bad for your lungs. Smoking can cause lung cancer among other lung affecting diseases. Asthma is a common disease that affects the lungs. Asthma attacks happen when your airways narrow after being irritated. The narrow airways make it hard for you to breathe in air. Pneumonia is a dangerous disease that makes it harder for your lungs to absorb oxygen from the air you breathe. 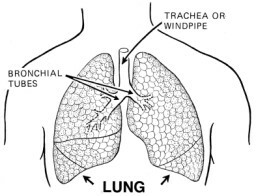 Other lung diseases include emphysema, tuberculosis and bronchitis.